A couple of weeks ago, this cake was cake of the week for the Weekly Bake Off. Sadly, I missed out because being that it was Miss A's epic five-day birthday celebration, there just wasn't enough time to make any more cake. Well not when you have a full time job and a toddler to look after too. On any given day, my favourite flavour cake varies. Lemon or a decent coffee cake are definitely way up there. 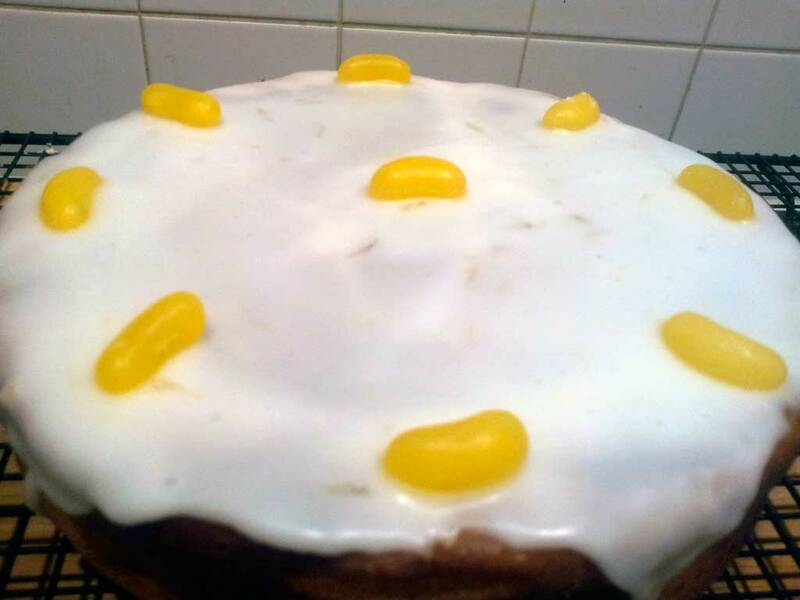 Lemon cake is the very first cake I actually remember eating. We were on holiday in Wales when I was about four and stopped in a little tea room run by a lady called Dulcie in a place called Solva. The cake was beautifully moist and had snow white, lemon-sharp icing which crackled as you put your fork through it before softly yielding to the cake. And being it was the very early eighties, it was adorned with lemon jelly slices. I don't think I've ever eaten such a memorable piece of cake since. Maybe I never will. 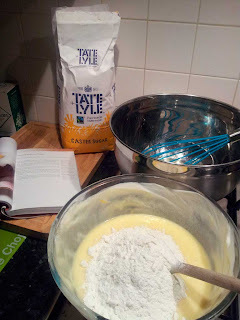 If I'm making lemon cake myself, I normally use a four egg sponge, laced with lemon zest and the juice of a lemon. Once baked and cooled, I then slice and fill it with lemon curd (it will always be home made curd since I tried Nigel Slater's recipe) and top with a thick royal icing made with lemon juice rather than water. And of course, lemon jelly slices on the top. It's retro-chic. And then, of course, there's now Maria's Lemon Celebration cake to add to this list. It formed the base of Miss A's birthday cake and I really enjoyed this. To the point that I may make it my regular large lemon bake instead of my four-egg mix. For once, I made this cake entirely by hand rather than with my Kenwood. Mostly because I had to bake after tea and this is the husband's telly-watching time when all other noise is banned. So no chance of getting away with the noise of the Kenwood. It was actually really satisfying to bake in this way. I've always had a hand mixer even before the Kenwood but it was really nice to cream the sugar and eggs and whip the egg whites with only the most basic of utensils. The old fashioned way. In fact, that's one thing I like about Berry's recipes. Unlike the current fashion for insisting that one must mix their cakes in a stand mixer or not use the recipe, Berry simply tells you to beat or mix or whisk without insisting you have expensive gadgets (okay so this is my own interpretation of certain books, but there does seem to be a bit of snobbyness in some books if you don't have the exact right equipment). So this cake has a lot to live up to. I could smell it baking away even though I'm two floors up from the kitchen. And it's smelling pretty good. 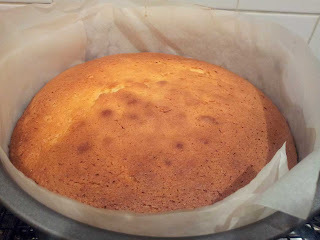 Just as I was about to click publish, the hour of baking was up and I have a perfectly risen, nicely browned cake although the crust feels a little firm and I'm so tempted to put a drizzle over it. But I'm having faith in the Berry that it doesn't need it. Of course, because I had to bake so late I won't be able to ice it before bed time as I doubt it will cool down before I go to sleep. So final pics will have to come in the morning. But if you want to get an idea of how it does look, hop over to the Weekly Bake Off and look at all the stunning entries there. Mine will never look as stunning as those because I'll have to decorate it at 5am and it's for a bunch of guys who won't care that it doesn't look fancy so long as it fills their bellies. 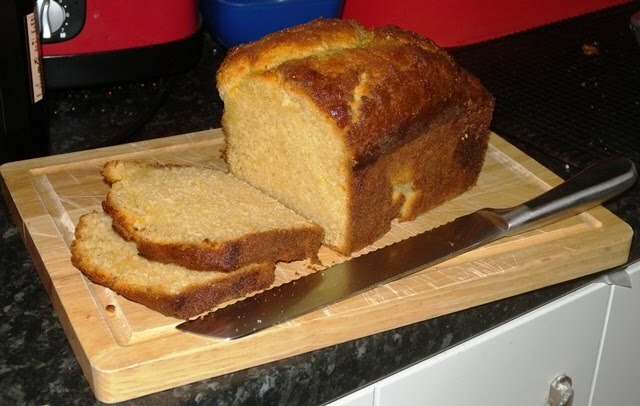 If you want great advice on baking this yourself, you should also take a look at Jaim's Kitchen where she has written about her experience with this bake. She tested it for breakfast which I think is an amazing idea and I may just do myself. Just for research purposes of course. Will update tomorrow with a finished pic and the verdict from the hungry hoardes. Well that's the last time I'm taking cake into work. I couldn't give it away! Okay so I got stuck in a meeting and by the time I was liberated, the office was pretty much desserted so half of the cake came home with me again. I've still not had a bit but those that did said it was really good. It looks to have quite a dense texture but was much moister than I was expecting as it felt quite crusty when I took it out of the oven. As for the icing, well I'm back on my rant that Miss Berry is tight on the icing front. I went for 25% more icing and this still wasn't enough in my opinion to get a thick even coating to the cake. If you look at the picture, you'll see that the poor artificial lighting in my kitchen exposes the lack of icing coverage in place. I would definitely use a bit more in the future to get a perfect white coating. Definitely a bake again one.